pop culture and social commentary with his painting You Are Out Of Your Mind! Playing with “mind” idioms is one way to blow your mind. Another is to examine the world through your mind’s eye. If you could read my mind you could clearly see that my mind is in the gutter. And amidst all this madness and lunacy is the real mind trap. So take a load off your mind and get past the notion that this painting is a sick idea. at least until you forget what you are doing, since you have a mind like a sieve. 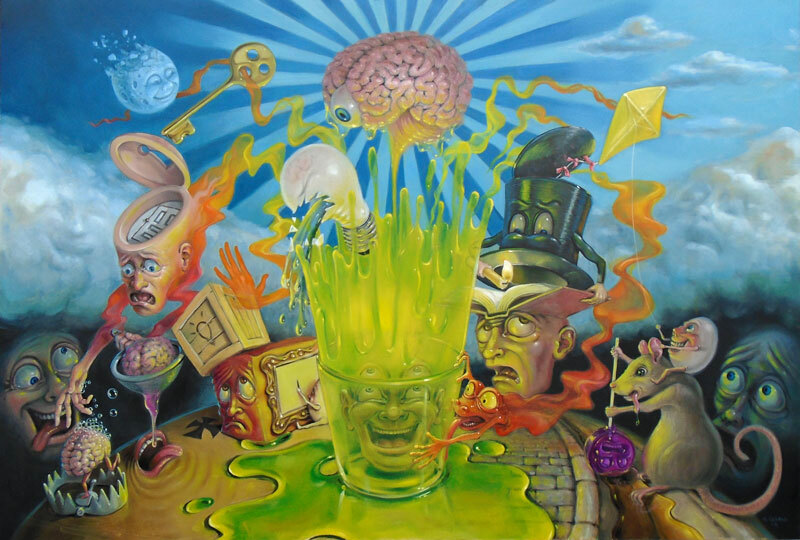 This entry was posted in Canadian Artist, Canadian painter, Canadian Surrealism, Pop Surrealism, stephen gibb artist, Surrealism and tagged brain, mind, out of your mind. Bookmark the permalink. Both comments and trackbacks are currently closed.